This one requires crossing the Walt Whitman Bridge and heading for Upper Darby, PA, close by Drexel Hill where I was born and raised so verrrrrrrrry few years ago . This was my third trip to this homey, neighborhood, Italian restaurant where the atmosphere is every bit as charming as the food. Bona Cucina has been making diners happy here for the past 25 years and Pat and Frankie Buonadonna are justifiably proud that just a week ago, the mayor and Upper Darby Town Council stopped in to present the couple with a Proclamation praising their quarter of a century of good food and good will for the community. Let me say right now, before I get into food pictures and tales of lifelong friendships shared with my dinner companions, Bona Cucina has a great menu and the food is excellent. 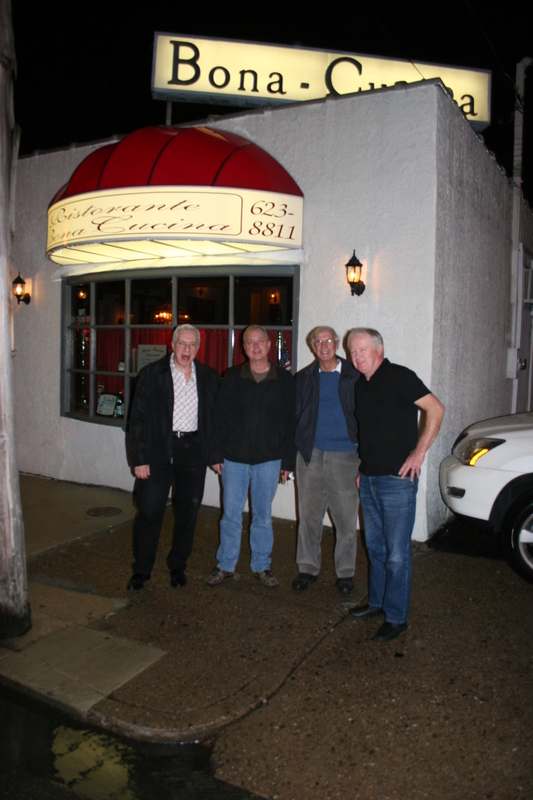 I was joined by lifelong Oakview associates, Frank, Steve, Ange and Val. None of them total wine geeks like myself, but, a couple of them enjoy the grape when it’s available. We don’t get to do this very often so each dinner is a conversational event as we catch up on the tales of our lives and those of friends not present. Tonight was no exception and it was fun taking turns telling lies and trading insults. 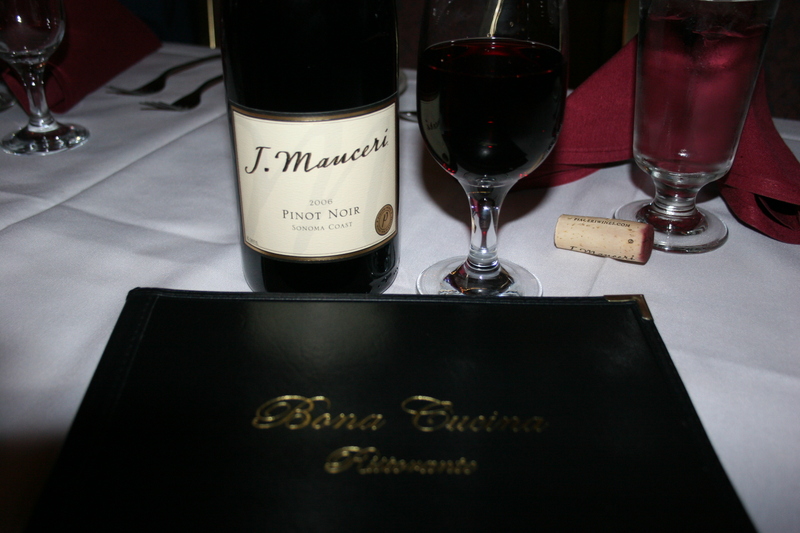 My wine for the evening was a 2006 Mauceri, Sonoma Coast, Pinot Noir. This is one of the Newman wines. By that I mean, the former Chairman of the PA State Stores who was doing such a good job bringing new life and credibility to the antiquated and uninspiring booze system in the state, that he was unceremoniously replaced by an unqualified pretender who was a friend of Governor Rendell. Anyway, Jonathon Newman started his own company and he travels to wineries and works deals to bring their wines into his fold. They are usually then sold at prices well below retail and some of them are pretty good. This one was not bad. There are a few, not many, Pinot Noir’s under $20.00 that I find quite drinkable. This wine fell into that category, except that it cost more than $20.00, and therefore, should have been better. It should have performed as well as my potato soup starter did as an appetizer. The soup was flavorful and seasoned to perfection. As I mentioned earlier, it’s a great menu with lots of choices that I know would be terrific. However, once again, as I have on each occasion that I have been to Bona Cucina, I ordered the reliably delicious Chicken Celeste. 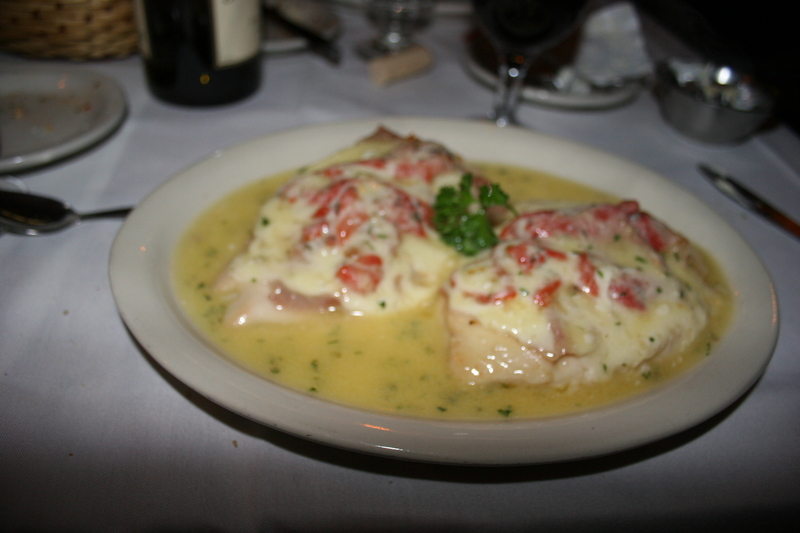 Two very generous portions of melt in your mouth golden chicken breasts, topped with imported prosciutto, roasted peppers, smoked provolone cheese in a white wine sauce. There was enough to bring home for another meal. I didn’t bring any home. I was glad last night that I didn’t. I regret it at this moment because talking about it is making me wish I had some now. 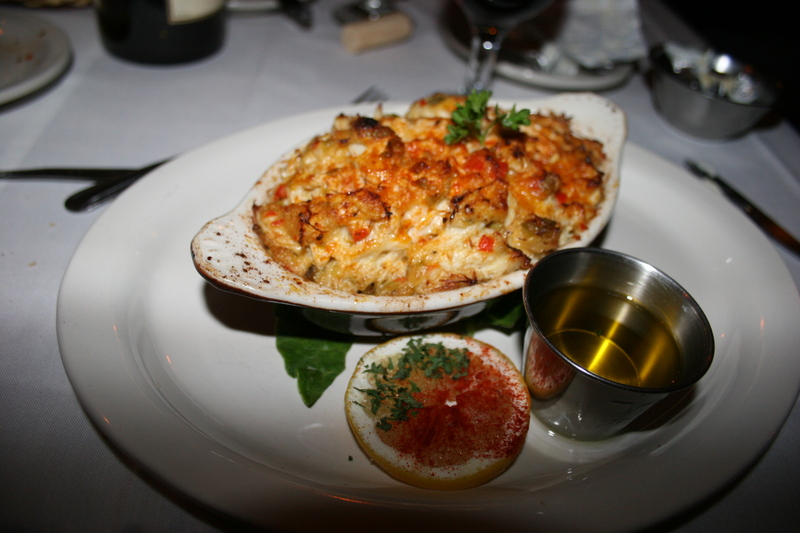 Here are a few more of the dishes that my friends found equally palate pleasing. 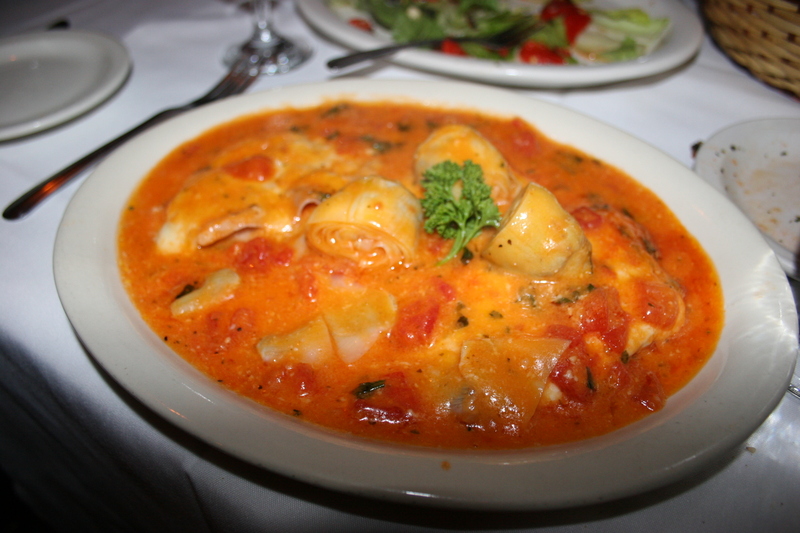 Left to right is Val’s Crab Imperial, Ange’s Veal Napolatano, veal sauteed with prosciutto, mozzarella, artichoke hearts, basil and fresh tomato in a white wine sauce. 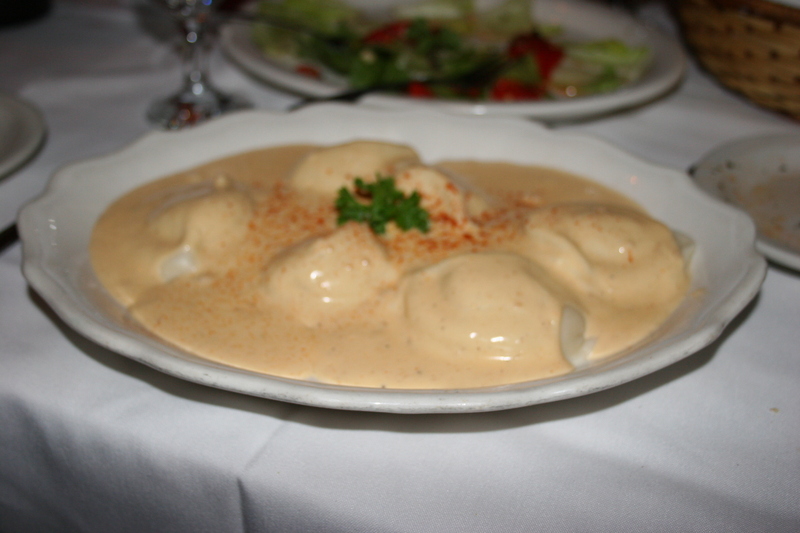 Steve’s Lobster Ravioli which was one of the evening’s specials. Frank had the Chicken Parmigiana which looked like most Chicken Parms except this one tasted better. Everyone thoroughly enjoyed their meals and we lingered for another hour trading stories with Frankie, the owner, who doubles as one of the waitresses. Her presence adds greatly to the ambiance of Bona Cucina as she is a character who spreads her own type of “joie de vivre” to each table she visits. 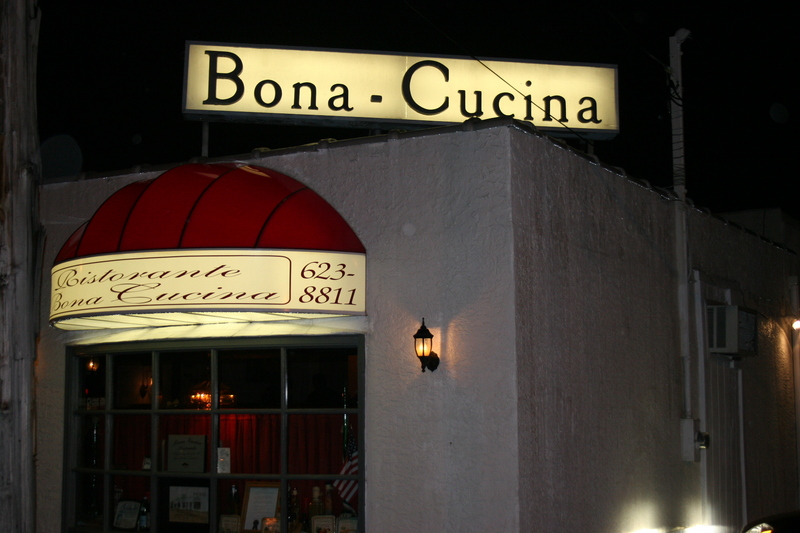 Bona Cucina isn’t fancy, the food is good, the atmosphere is cozy, and Pat and Frankie are two down to earth, good people, who know how to make, and serve, great food.